Originally posted on February 12, 2011, ahead of the other wedding of the decade, that of William and Katherine. As I write this, there is no word on the designer Kate Middleton has chosen to create her wedding gown, though I have heard many breathless accounts of who is and who is not in the running. So let’s indulge our royal wedding mania by looking at some of the gowns worn in the past. 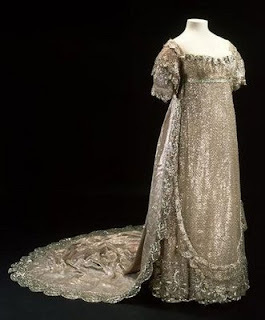 Above is the dress worn by Princess Charlotte of Wales at her May 2, 1816, wedding to Prince Leopold of Saxe-Coburg, as exhibited in the Museum of London here. 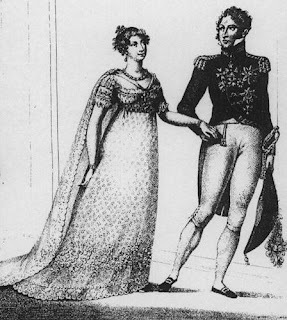 The Lady’s Magazine of May, 1816, described the gown: White silk net embroidered in silver strip with a spotted ground and borders. 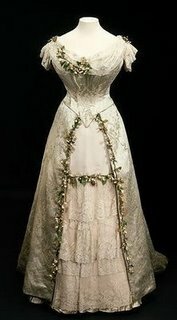 The wedding dress, composed of a most magnificent silver lama on net, over a rich silver tissue slip, with a superb border of silver lama embroidery at the bottom, forming shells and bouquets above the border; a most elegant fullness tastefully designed, in festoons of rich silver lama, and finished with a very brilliant rollio of lama; the body and sleeves to correspond, trimmed with a most beautiful point Brussels lace, in a peculiar elegant style. The manteau of rich silver tissue lined with white satin, trimmed round with a most superb silver lama border, in shells to correspond with the dress, and fastened in front with a most brilliant and costly ornament of diamonds. The whole dress surpassed all conception in the brilliancy and richness of its effects. Head dress, a wreath of rose buds and leaves, composed of the most superb brilliants.” At right, an engraving of Charlotte and Leopold at their wedding in Carlton House. The portrait of Queen Victoria, at left, is by Winterhalter. 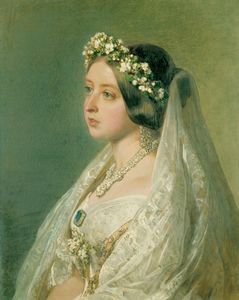 It shows a rather wistful young bride at the time of her wedding to Prince Albert of Saxe-Coburg (nephew of the above-mentioned Leopold) on February 10, 1840 in the Chapel Royal of St. James Palace. 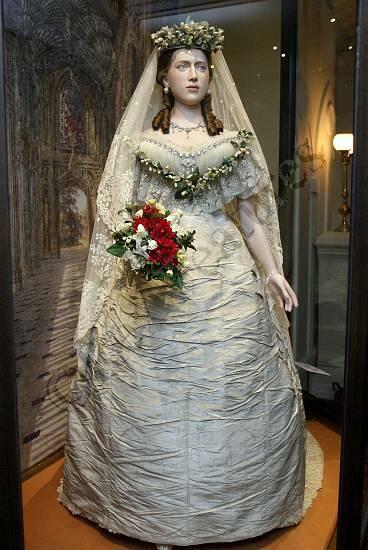 It was this gown and veil that supposedly has inspired generations of brides ever since to wear white for their ceremonies, though many brides had previously dressed in fashionable white as well as in a variety of other hues. At right, an image of Queen Victoria’s dress on a mannequin in the collection of Kensington Palace. Left, the wedding gown of Alexandra of Denmark, who married Victoria’s son, eventually King Edward VII, on March 10, 1863 in St. George’s Chapel at Windsor Castle. 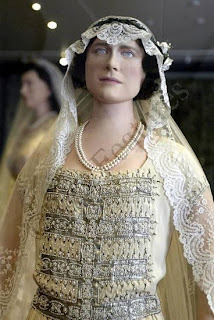 She was Princess of Wales for almost forty years before becoming Queen in 1901. After her husband’s death in 1910, she was known as the Queen Mother until she died in 1925. Like Charlotte’s mother, Caroline, Princess of Wales, and like the first wife of the present Prince of Wales, Diana (see below), Alexandra had to endure the infidelity of her husband. But unlike the other two, she stuck with him to the end. We’ve all heard the possibly-apocryphal story about how Alexandra invited one of his mistresses, Alice Keppel, to comfort Edward VII on his deathbed. Princess Mary of Teck wed Prince George, Duke of York on 6 July, 1893 in the Chapel Royal of St. James Palace. She had been engaged to Prince Albert Victor, eldest son of the Prince of Wales in 1891, but Albert Victor died in the great influenza epidemic of 1891-92. Mary and George fell in love and were married with the approval of Queen Victoria as well as Edward and Alexandra, Prince and Princess of Wales. George succeeded his father as George V in 1910. Queen Mary, who was a godchild of Queen Victoria, had five sons and one daughter. 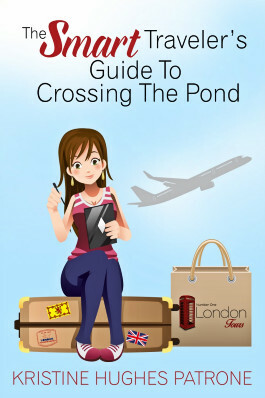 Her eldest son, known to all as David, was more than a disappointment. After inheriting the throne as Eward VIII in 1936, he abdicated less than a year later to marry Wallis Simpson. After her husband’s death, Queen Mary chose to be addressed as Her Majesty, Queen Mary, rather than as Queen Mother. She was very supportive of her second son, who became King George VI after his brother’s departure from the throne. According to several sources, she was the first dowager queen of Great Britain to ever attended the coronation ceremony of her husband’s successor. As Duke of York, the second son of George V and Mary grew up in the shadow of his dashing older brother. 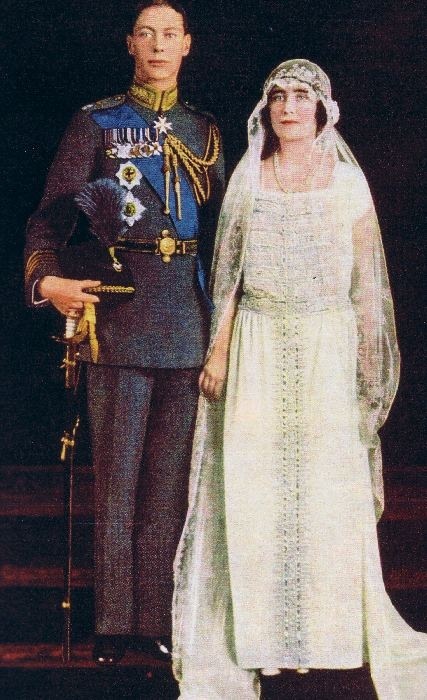 He married Lady Elizabeth Bowes-Lyon on 26 April 1923 in Westminster Abbey. At the time of the wedding, it was not expected that “Bertie” would take the throne. 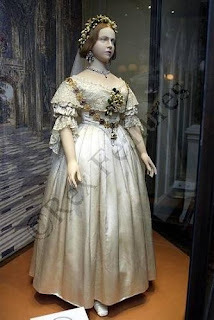 Lady Elizabeth’s gown, perhaps for that reason, was not as elaborate as some of her predecessors. It was certainly in the style of the day, a rather loose gown, slightly less than floor length. Below is the dress on a mannequin in a Kensington Palace exhibition of several years ago, along with a detail of the veil and bodice. 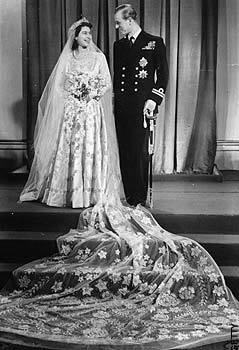 On 20 November, 1947, Princess Elizabeth (later Queen Elizabeth II) married Prince Philip of Greece (later Duke of Edinburgh) in Westminster Abbey. The designer was Norman Hartnell and the fabric is silk spun at Lullingstone Castle in Kent. 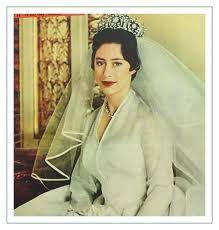 She wore a diamond and pearl tiara and a filmy veil. The long train was decorated with traditional symbols, such as Tudor roses and wheat. 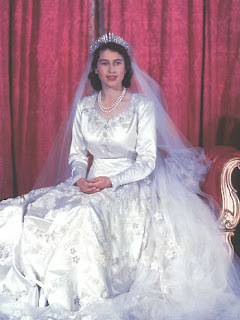 All the details of the royal romance, the wedding, the gown and the ceremony were eagerly read around the world. 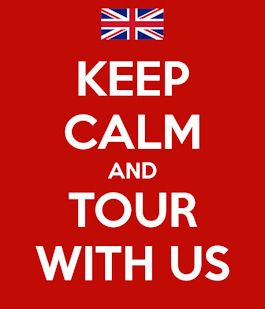 It is said the happy event was like a tonic to the war-weary Britons still enduring shortages of goods and rationing. Princess Margaret, second daughter of King George VI, married Antony Armstrong-Jones (later Earl of Snowdon) on May 6, 1960, at Westminster Abbey. Television cameras covered the event and the broadcast was seen worldwide. Like her sister, Margaret chose Norman Hartnell to design her bridal gown.The couple had two children: David, Viscount Linley in 1961 and Lady Sarah Armstrong-Jones in 1964. The Snowdons were divorced in 1978 and Princess Margaret died in 2002. 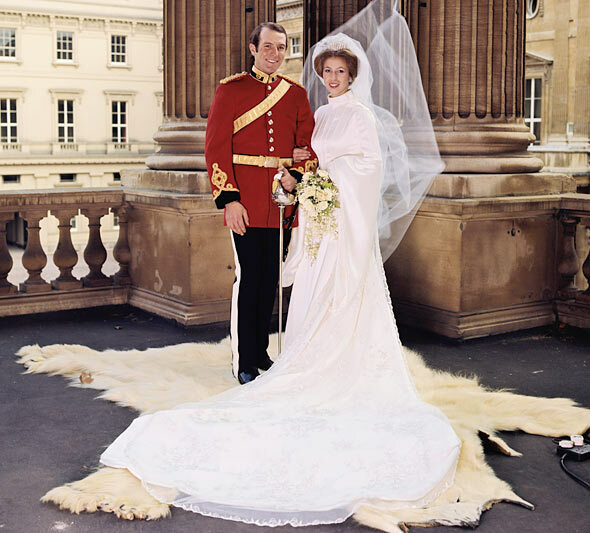 14 November 1973 – Anne, Princess Royal, married Captain Mark Phillips in Westminster Abbey. Born in 1950, she is Queen Elizabeth II’s only daughter. Anne and Phillips have two children, Peter Phillips born in 1977 and Zara Phillips born in 1981. 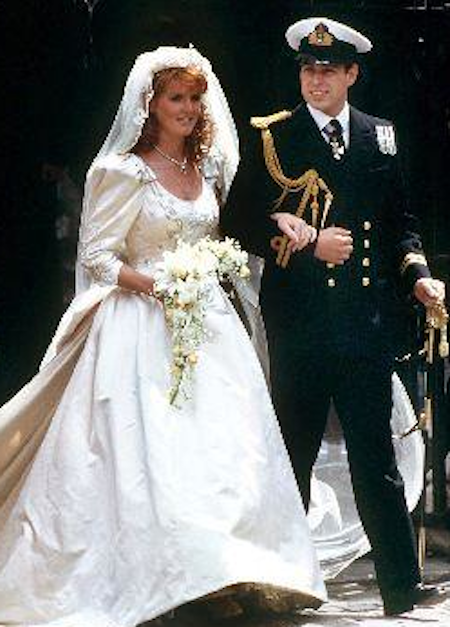 After divorcing Phillips in 1992, Anne married Timothy Laurence, in Scotland on December 12, 1992. 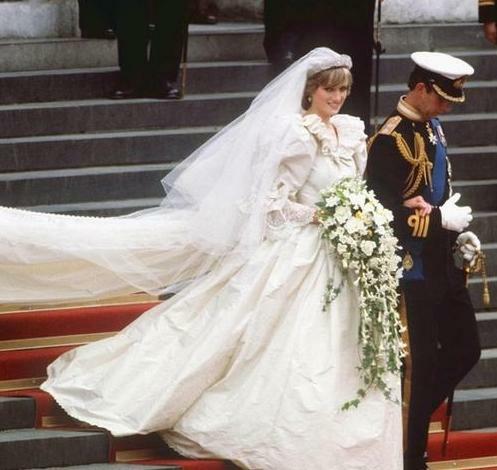 On 29 July 1981, Lady Diana Spencer and Charles, Prince of Wales, were married in St Paul’s Cathedral. Her dress was controversial — and still is. 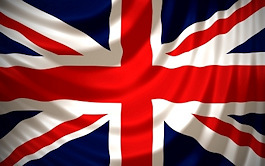 The designers, David and Elizabeth Emmanuel, immediately shot to the top echelon of British fashion. 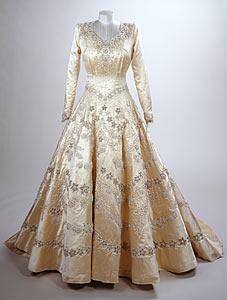 Like many of Diana’s fashions, the gown (or a replica) travels around the world for popular exhibition. in the late 1980s, the Prince living in Highgrove and the Princess at Kensington Palace. 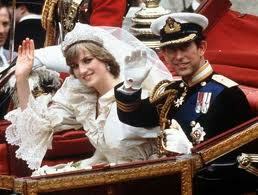 Formal separation came in 1992 and the marriage of Charles and Diana ended in divorce on 28 August 1996. On 31 August 1997, a year after the Prince and Princess divorced, Diana died in a car crash in Paris. Sarah Ferguson and Prince Andrew, the Duke of York, married at Westminster Abbey on 23 July 1986. 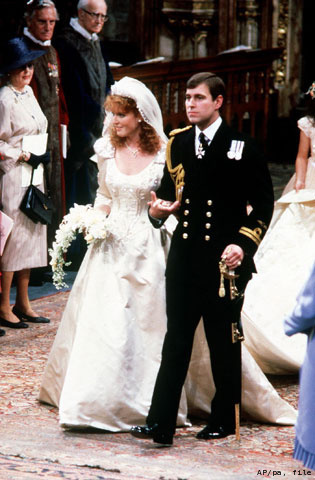 The Duke and Duchess of York had two children during their marriage: Princess Beatrice of York (born 1988) and Princess Eugenie of York (born 1990). They separated in 1992 and divorced in 1996, though they are often together for vacations and family events. If like us, you can’t get enough of this wedding stuff, here is a wonderful exhibition from the Royal Collection you will enjoy. I agree about Sarah's gown. I also liked Queen Mary's and Queen Elizabeth's. What a splendid post! Gorgeous gowns! It is fortunate I am NOT in a museum where these gowns are kept. I could moon over them for hours! Thank you, ladies! Previous Previous post: SIR EDWIN LANDSEER, R.A.